Giovanni Battista Quadrone (1844–1898), Every Opportunity is Good (detail) (1878), other details not known. Wikimedia Commons. During the 1700s, a new trade spread around Europe: the artists’ colourman. Although larger workshops had no trouble employing assistants to make fresh oil paint, stretch and prime canvases, and do all the other craft work required to support one or more active painters, smaller workshops and individuals struggled. 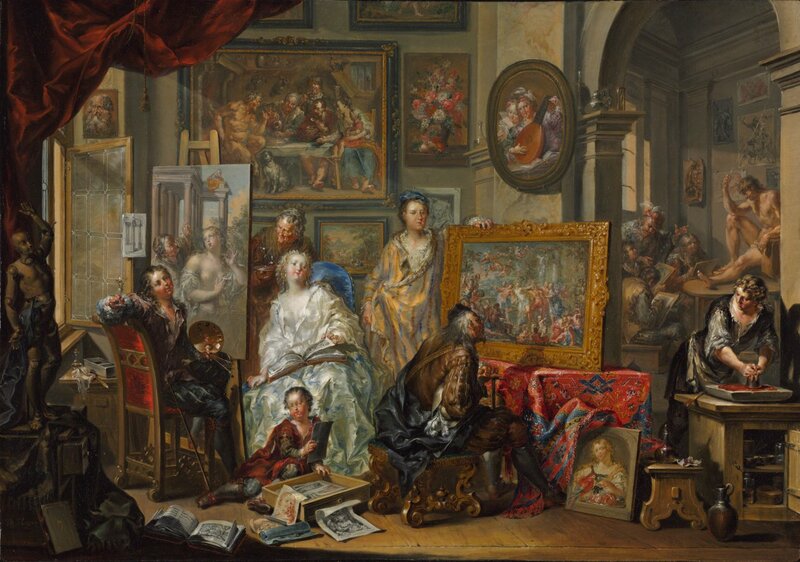 Johann Georg Platzer (1704–1761), The Artist’s Studio (1740-59), oil on copper, 41.9 × 60 cm, Cleveland Museum of Art, Cleveland, OH. Wikimedia Commons. Platzer’s The Artist’s Studio (1740-59) shows an assistant using a muller, at the far right, to prepare fresh oil paint for the painters at work in this workshop. Jan Josef Horemans the Younger (1714–1792) In the Painter’s Workshop (before 1790), oil on canvas, 62 x 59 cm, location not known. Wikimedia Commons. 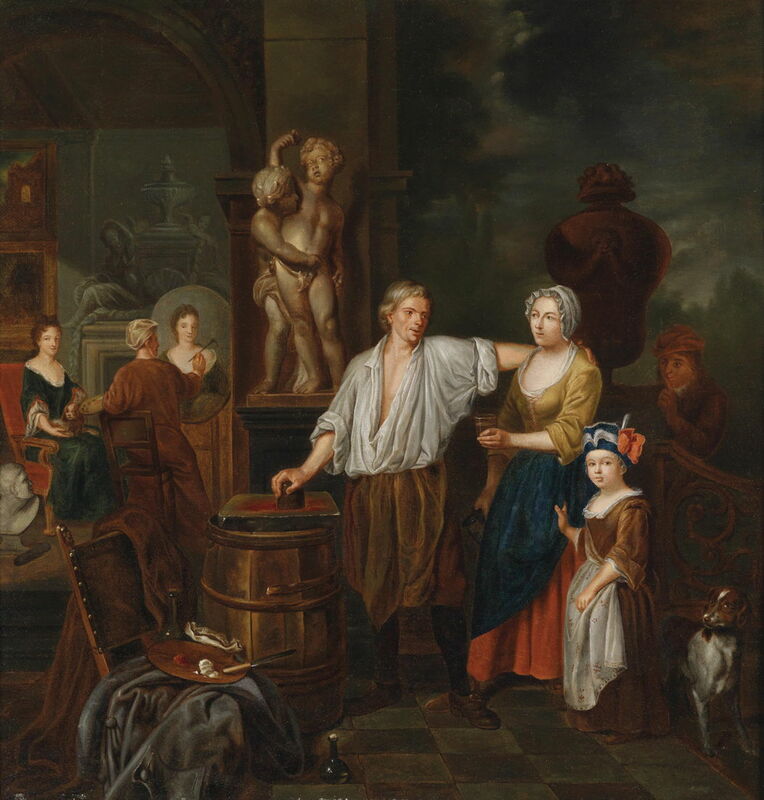 Horemans the Younger’s In the Painter’s Workshop (before 1790) puts the assistant in the centre, although he seems to be distracted by his family. The artists’ colourman may have been a skilled assistant in a big workshop, then realised that they could make a living from supplying stretched and primed canvases, prepared oil paints, and other materials to several smaller workshops, individuals (who might be wealthy amateurs, perhaps), and eventually even to larger workshops. One problem which they had to solve was how to supply oil paints, which were messy and tended to dry. It had long been known that excluding air from drying oils prevented them from drying, and someone discovered that oil paint would remain fresh and contained when it filled a small bag, such as a pig’s bladder. By the late 1700s, artists’ colourmen throughout Europe were selling their oil paints in these bladders. Giovanni Battista Quadrone (1844–1898), Every Opportunity is Good (1878), other details not known. Wikimedia Commons. 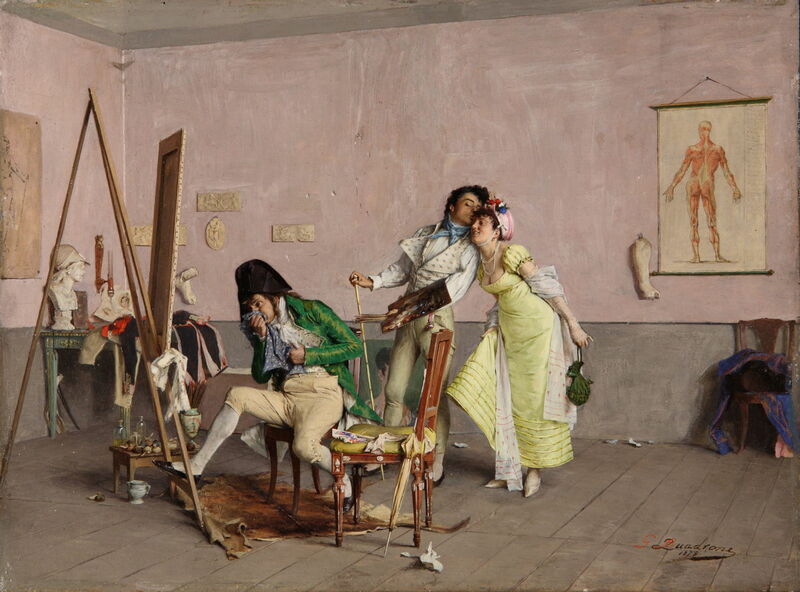 In Quadrone’s witty Every Opportunity is Good (1878), we are allowed a detailed look at the painter’s paraphernalia, which includes several paint bladders on the low table behind the easel, and one on the floor. 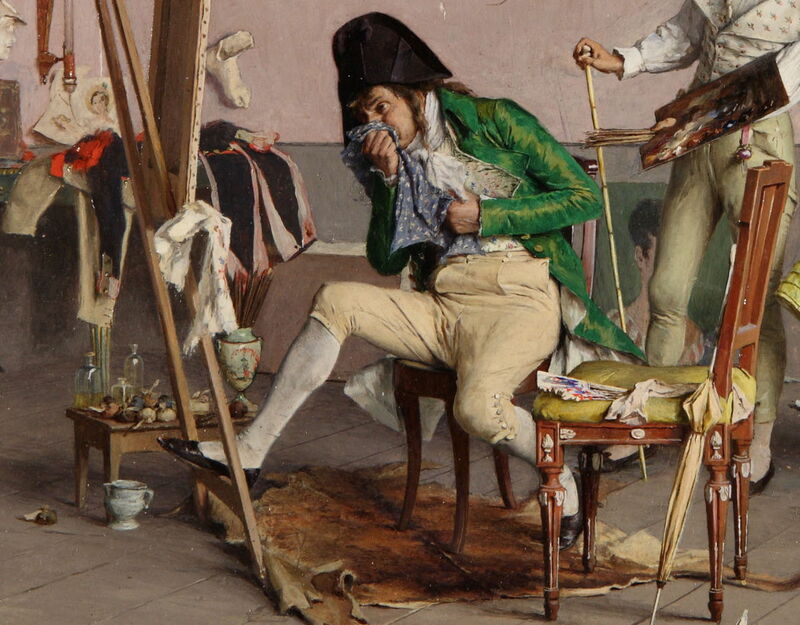 Although this was painted well after the introduction of paint tubes (which I will cover in a subsequent article), bladders remained relatively cheap and popular quite late in the 1800s. Paint bladders transformed oil painting, most of all because they made oil paint portable. No longer was the painter constrained to using oil paints in the studio, but they could take a lightweight easel, small panels or canvases, and some bladders of paint outdoors, and paint en plein air, with the landscape in front of them. 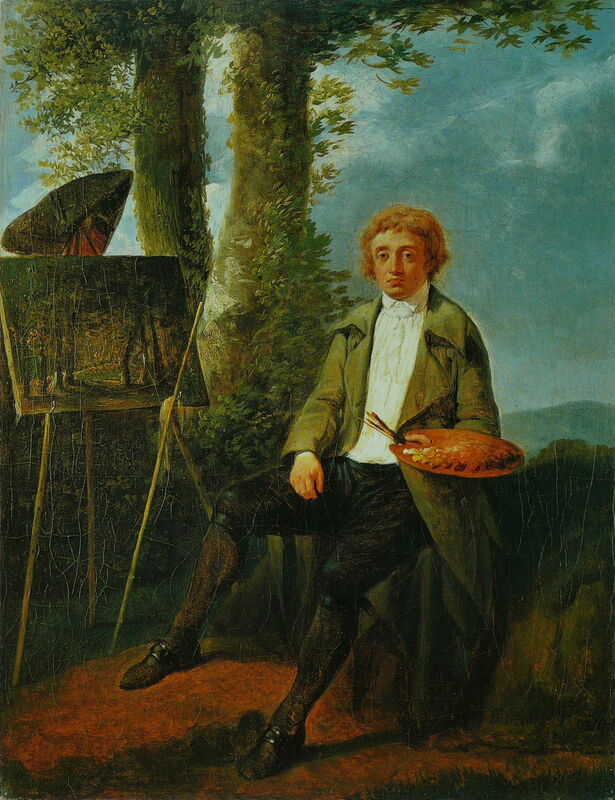 Jacques Sablet (1749–1803) Portrait of the Painter Conrad Gessner in the Roman Campagna (1788), oil on canvas, 39 × 30 cm, Kunsthaus Zürich, Zürich. Wikimedia Commons. The paint supplied in these bladders was also more consistent: good artists’ colourmen made good, reliable, and consistent paints, so the painter could rely on a trusted supplier rather than having to train their own assistants. Of course there were poor paints supplied by bad colourmen, but the market soon sorted those out. With the ‘enlightenment’ and colourmen, the 1700s should have seen improving quality and standards among those painting in oils. Sadly, that was not always the case: sometimes it was the more conscientious painter, who aspired to equal the Masters of the Renaissance, Rubens, van Dyck, and most of all Rembrandt, who almost literally came unstuck. One of the most famous and prolific portrait painters, Reynolds had a conventional training in oil painting with Thomas Hudson (1701-1779), a successful portrait painter who used traditional and conservative methods with roots back to the late 1600s. This used layers, starting with dead colouring, the laying in of shadows and lights, then blending in transitions of shading and colour wet-on-wet. Highlights were then brought out, and shadows glazed, to produce a series of thin layers, and a smooth, finished paint surface. Sir Joshua Reynolds (1723–1792), Mrs. Robinson (c 1784), oil on canvas, 88.6 x 68.9 cm, Yale Center for British Art, New Haven, CT. Wikimedia Commons. Sir Joshua Reynolds (1723–1792), Mrs. Robinson (detail) (c 1784), oil on canvas, 88.6 x 68.9 cm, Yale Center for British Art, New Haven, CT. Wikimedia Commons. 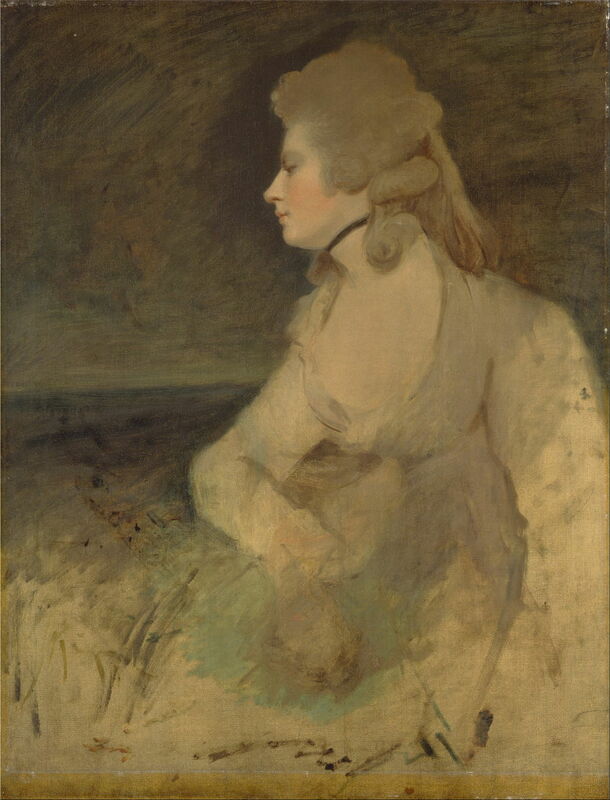 Reynolds’ early stages are shown well in this abandoned portrait of Mrs Robinson (c 1784), where most of the paint layer is sufficiently thin as to allow the texture of the canvas to show through. 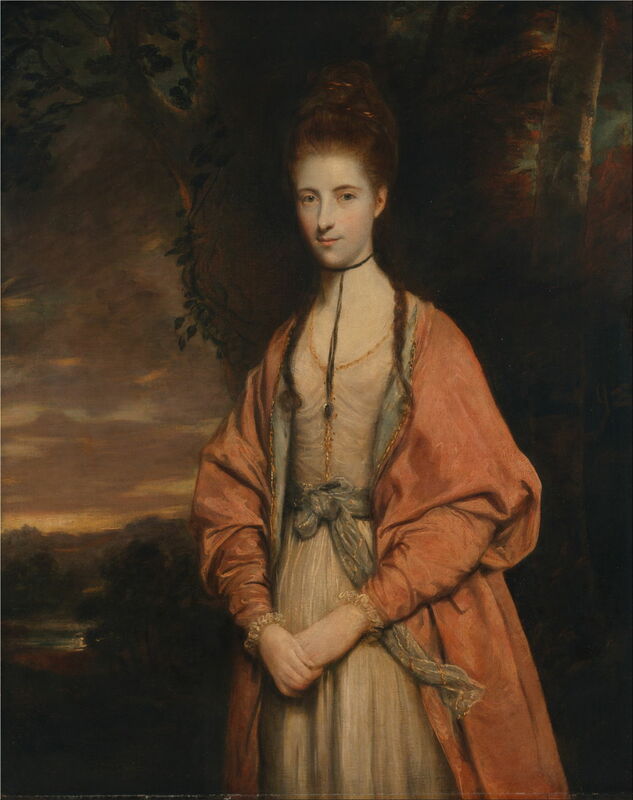 Sir Joshua Reynolds (1723–1792), Anne Seymour Damer (née Conway) (1773), oil on canvas, 125.7 x 99.1 cm, Yale Center for British Art, New Haven, CT. Wikimedia Commons. 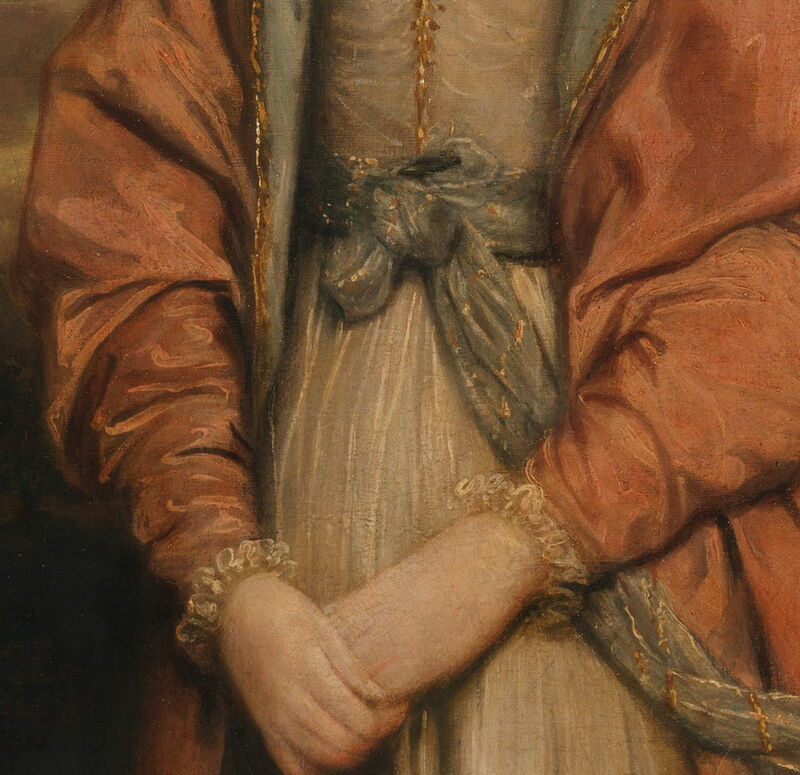 Sir Joshua Reynolds (1723–1792), Anne Seymour Damer (née Conway) (detail) (1773), oil on canvas, 125.7 x 99.1 cm, Yale Center for British Art, New Haven, CT. Wikimedia Commons. His portrait of Anne Seymour Damer (née Conway) (1773) shows this technique working well, with painterly highlights, and textures in the fabrics. That of flesh has aged well, with limited fine cracking visible. 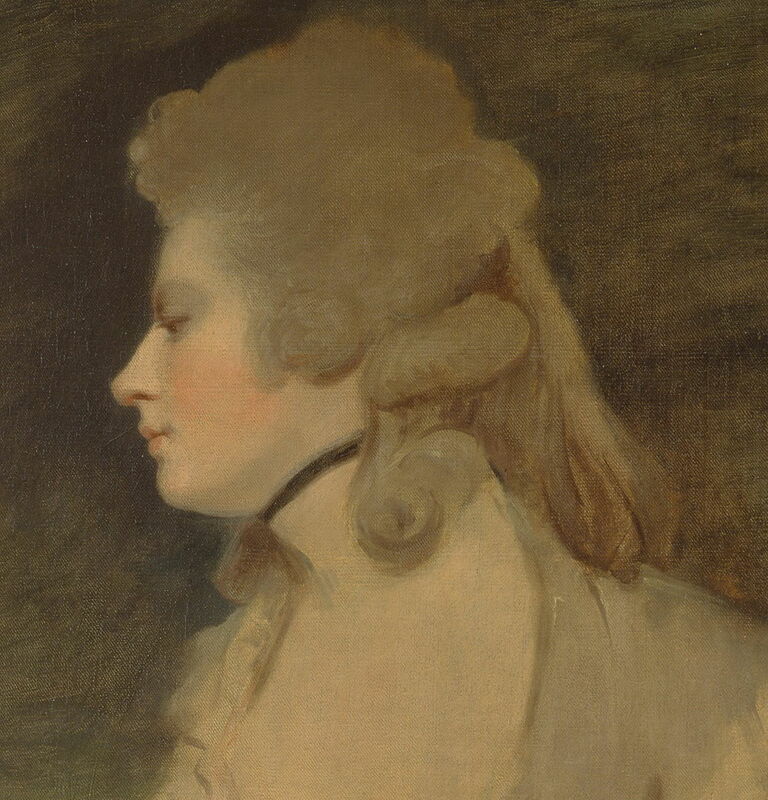 Reynolds aspired to the greatness of the Masters, and in his quest to achieve that, he experimented, particularly after he visited Italy in 1749-52. Most of his canvases were supplied stretched and primed by colourmen, but Reynolds appears to have customised his paint composition very considerably, if he did not have it made to his own specifications. 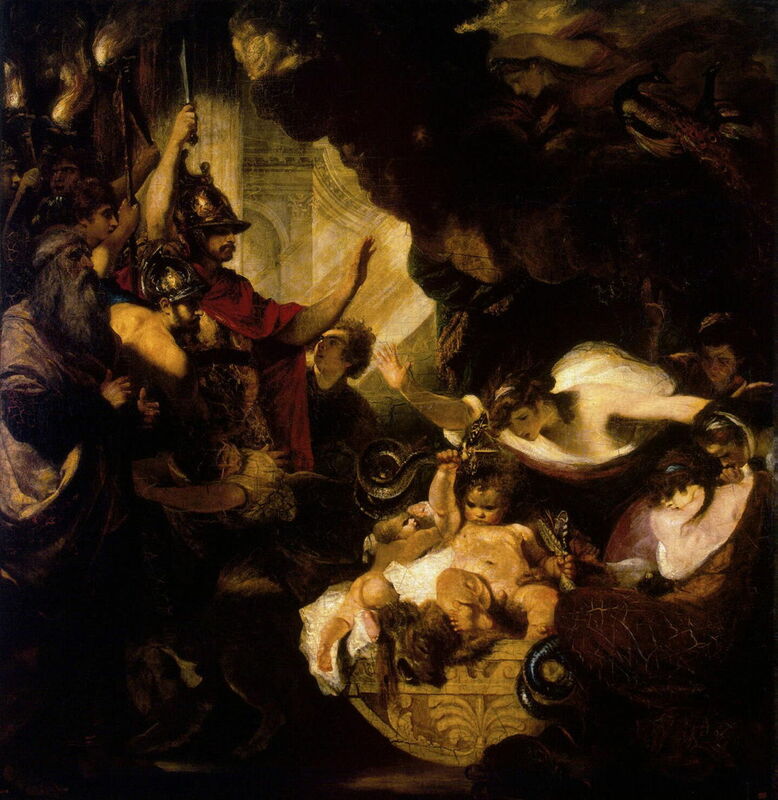 Seeing that the works of Masters, such as Rembrandt, had passages with quite thick applications of paint, Reynolds also applied his paint thickly in appropriate passages. In order to make the paint viscous enough for that, he took to adding mediums which he felt resembled those used by the Masters. He seldom scraped back paint in order to correct or change his paintings, but applied more paint over the top of as many as ten previous layers, some of them quite viscous and thick. His records of ‘experiments’ with paint are not given in sufficient detail to reproduce any of his materials, but contain references to the use of copaiba balsam (a controversial oleo-resin thickener which can inhibit drying), wax (which he was convinced was the secret of success of the Masters), and bitumen (which inhibits drying). His drying oils were linseed, walnut, and poppy seed, with the latter two mainly used for lighter-coloured paints. They were often heat-treated to pre-polymerise and thicken them. But his greatest downfall, as far as the longevity of his paintings is concerned, was his excessive use of resins, including mastic, pine, and copal, as well as the oleo-resin copaiba balsam. Contemporaries recorded that some of his portraits cracked before they had even left the studio. Reynolds also experimented with the most dangerous medium of all: Megilp. Known by a variety of similar names, he is the first British artist known to have referred to its use. Megilp is made by heating a drying oil with a lead drier (usually litharge), then adding substantial amounts of resin until it produces a thick paint of buttery consistency. Variants using different kinds of ‘black oil’ were even more likely to compromise the longevity and structural integrity of paintings. Reynolds seems to have been addicted to them. Sir Joshua Reynolds (1723–1792), Lady Sunderland (1786), oil on canvas, 238.5 x 147.5 cm, Gemäldegalerie der Staatlichen Museen zu Berlin, Berlin. Wikimedia Commons. 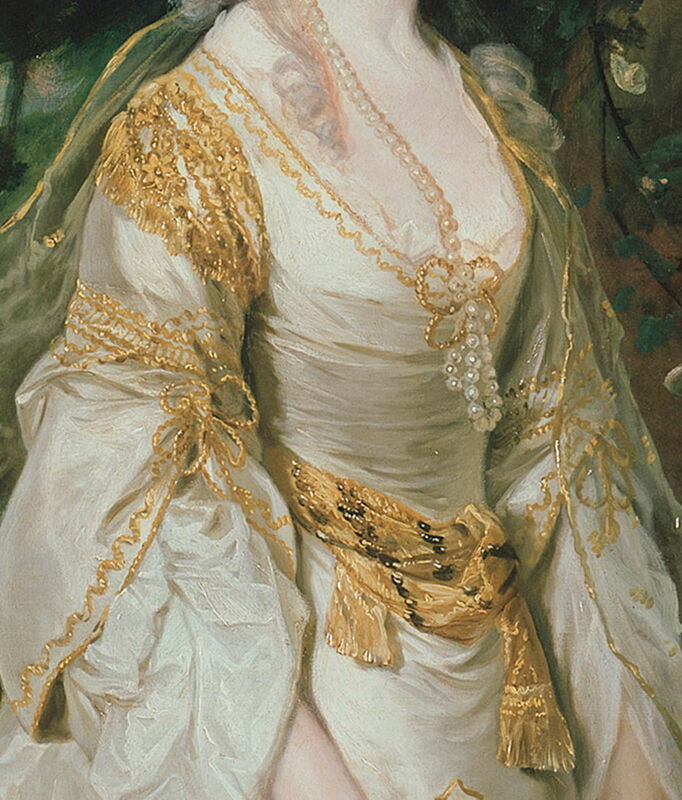 Sir Joshua Reynolds (1723–1792), Lady Sunderland (detail) (1786), oil on canvas, 238.5 x 147.5 cm, Gemäldegalerie der Staatlichen Museen zu Berlin, Berlin. Wikimedia Commons. 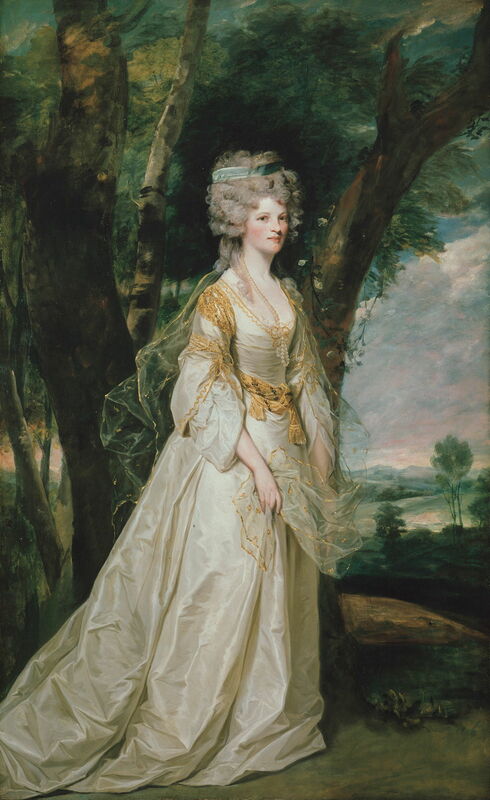 His portrait of Lady Sunderland (1786) has survived rather better than many of his paintings. 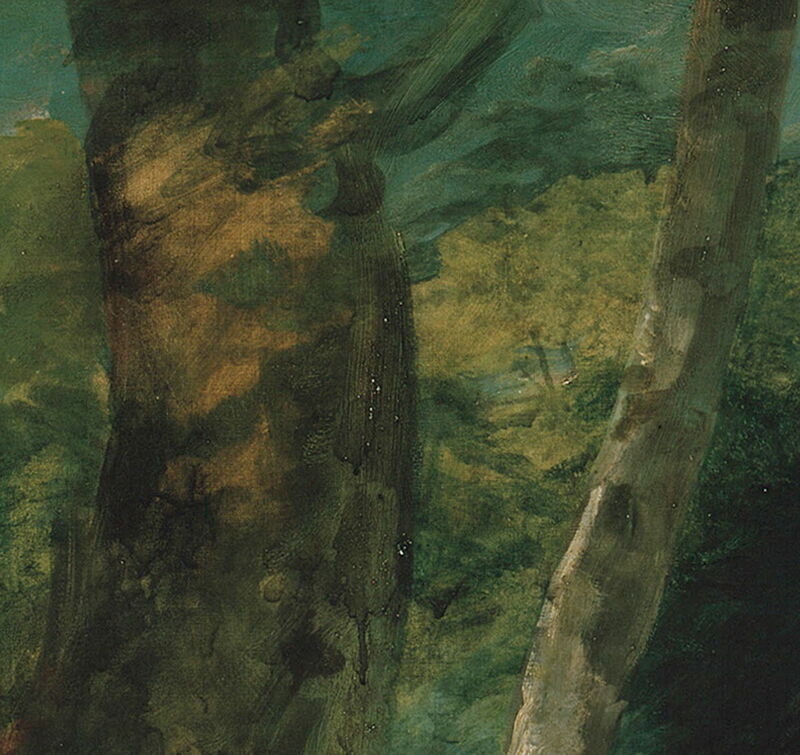 But a more careful look at its background shows where paint, presumably diluted with turpentine to aid its rapid application, has run, although other parts of the same brushstroke still show the marks of the brush, indicating that the paint had also been thickened prior to dilution. Sir Joshua Reynolds (1723–1792), Cupid Untying the Zone of Venus (1788), oil on canvas, 127.5 x 101 cm, Hermitage Museum, Saint Petersburg. Wikimedia Commons. 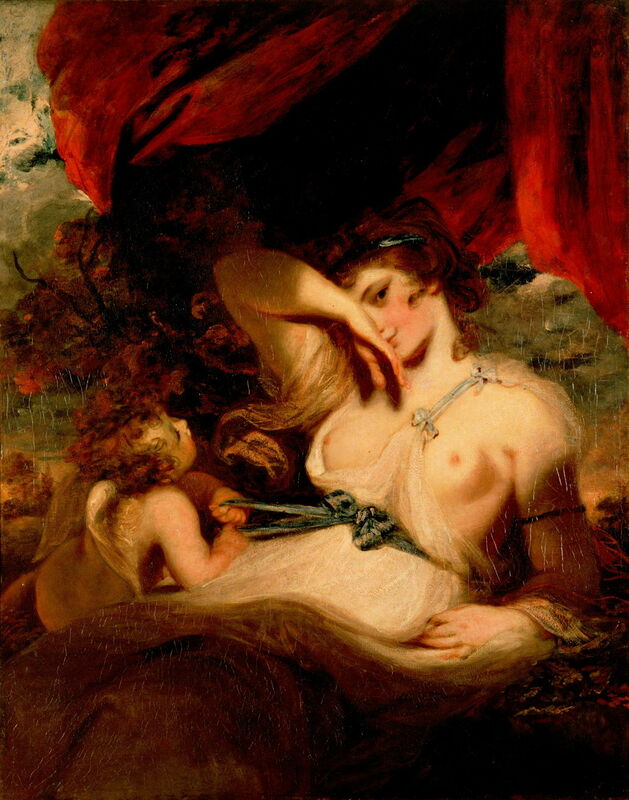 Sir Joshua Reynolds (1723–1792), Cupid Untying the Zone of Venus (detail) (1788), oil on canvas, 127.5 x 101 cm, Hermitage Museum, Saint Petersburg. Wikimedia Commons. 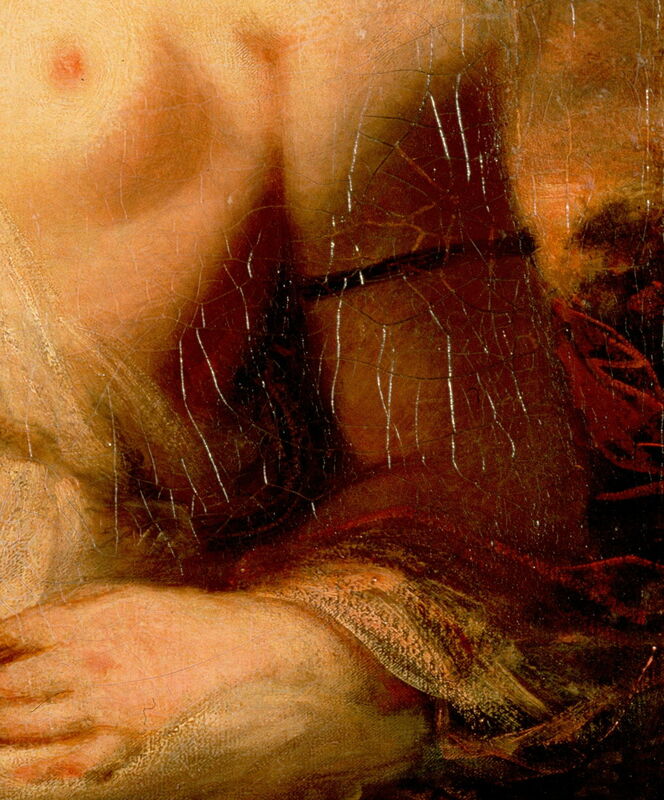 His Cupid Untying the Zone of Venus (1788) has catastrophic cracking indicating that surface layers of paint have detached from lower layers. In parts, those cracks have become filled with lighter paint which has risen up from a lower layer, which was drying more slowly than the more superficial layers. This detail also shows the wide variation in thickness of the paint layer: some passages are thin enough to allow the texture of the canvas to show through, while others are so thick that layers have separated. Sir Joshua Reynolds (1723–1792), The Infant Hercules Strangling Serpents in his Cradle (1788), oil on canvas, 307 × 297 cm, Hermitage Museum, Saint Petersburg. Wikimedia Commons. 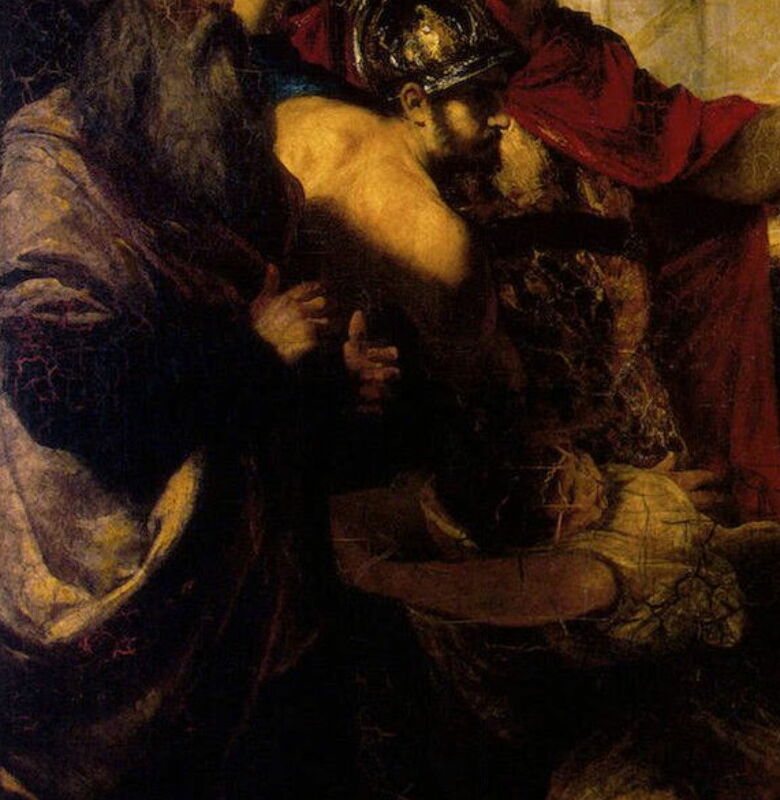 Sir Joshua Reynolds (1723–1792), The Infant Hercules Strangling Serpents in his Cradle (detail) (1788), oil on canvas, 307 × 297 cm, Hermitage Museum, Saint Petersburg. Wikimedia Commons. 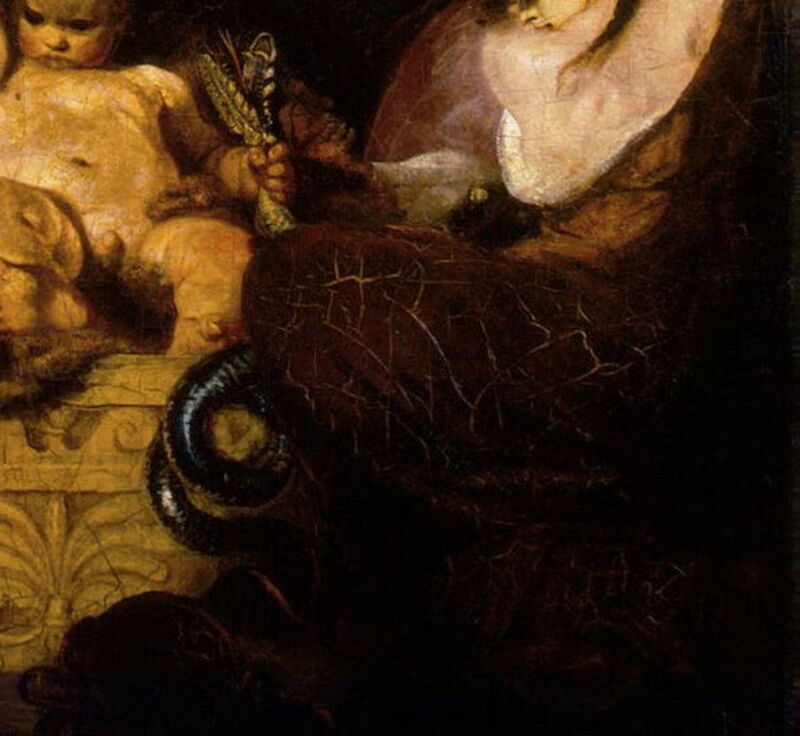 Similar loss of structural integrity has afflicted his The Infant Hercules Strangling Serpents in his Cradle (1788), in its thickly-painted passages. Other parts of that painting appear to be in need of extensive conservation work to restore details which have become largely unintelligible because of problems in the paint layer. Sadly, Reynolds was not the first, and by no means the last, painter to compromise their oil paintings, from their desire to emulate the Masters. There were also many more who were tempted to use Megilp and its variants, in the forlorn hope that it would improve their paintings. Gent A (2015) Reynolds, Paint and Painting: a Technical Analysis, in Joshua Reynolds, Experiments in Paint, eds. L Davis & M Hallett, The Wallace Collection & Paul Holberton. ISBN 978 0 9007 8575 7. Posted in General, Painting, Technology and tagged bladder, colourmen, history of painting, Megilp, oil paint, oil painting, painting, resin, Reynolds. Bookmark the permalink.